Yet another reason for gratitude this Thanksgiving! The Mizrahi Law Blog wishes all of you a wonderful Thanksgiving (or, Thanksgivukkah if you are celebrating that!). There are so many reasons to be grateful this year. While many of them are personal to each of us, there is one that all of us should celebrate: the expansion of paid family leave to California workers. Family leave laws are tremendously important. They allows workers — female and male — to put their families first and take time off to care for them when they are in need. Leave laws are one component in a broader set of laws that protect workers who care for their families, allowing men and women both to lead richer, fuller lives without fear of losing their jobs or being “mommy tracked” or “daddy tracked.” This issue has always been close to my heart, but as a parent myself, it has particular significance. . . .
You may have seen the photo above making the rounds on the internet. 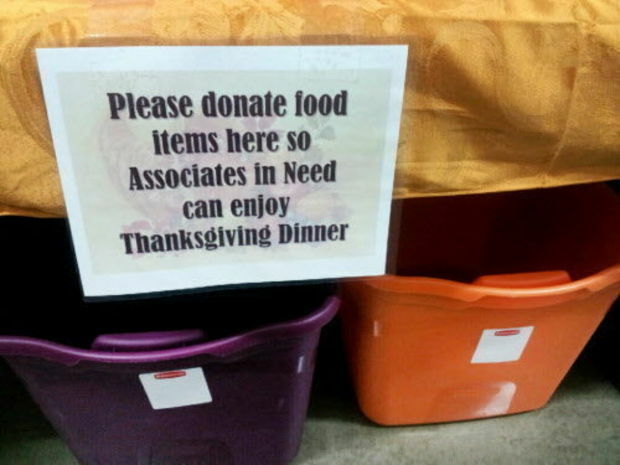 It’s from a Canton, Ohio Wal-Mart store where management put out bins for workers to donate food to other workers for Thanksgiving dinner. 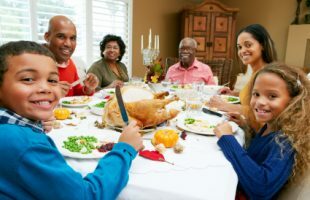 In “Giving thanks: A luxury that Wal-Mart workers can’t afford,” a blog post written for CELA Voice, Sharon Vinick and I discuss why this photo is so significant. . . .
Can you say with confidence if you are eligible for leave under the Family and Medical Leave Act (FMLA), California Family Rights Act (CFRA), Pregnancy Disability Leave Law (PDLL), or other laws? Do you know how much time you would be permitted to take off under each of these laws? Do you know the total time you could take off? If you answered anything other than “yes” to these questions, you are like most workers I speak with who don’t yet know what their leave rights are. Read on, and hopefully you will find the information you are looking for. This is the third post in a four-part series on California’s parental and family care leave laws. In the first two posts, I identified the barriers that prevent workers from taking time off to bond with new babies and care for sick relatives and discussed two of them: the need for job-protection and the financial hardship caused by unpaid leave. In this post, I address yet another barrier to California workers taking the full leave time to which they are entitled: a lack of knowledge about their rights. This is the second post in a four-part series on California’s parental and family care leave laws. Last week, I identified the main barriers that prevent workers from taking time off to bond with new babies and care for sick relatives. In that post, I discussed the first barrier—lack of job protection—and covered some of the laws that offer job protections to California employees as well as avenues to expand them. This post discusses the second barrier that prevents employees taking time off from work to care for their child or for another family member: that they cannot financially afford to take the time off from work. We have crafted laws that allow for workers to take unpaid leave for caregiving, including the Family and Medical Leave Act (FMLA) and the California Family Rights Act (CFRA). However, many people who have the option of taking job-protected leave cannot do so because of the financial strain caused by unpaid leave. 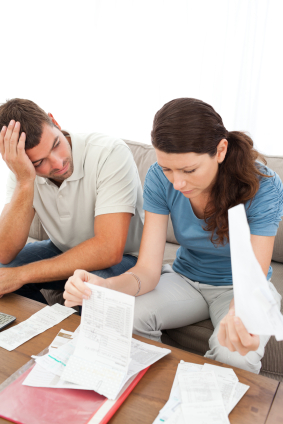 What good is job-protected leave if you can’t afford to take it? . . .
Will you take family leave? California moms: did you know that the majority of you may be eligible for nearly seven months of job-protected time off related to the birth of your child? Did you know that most of your time off would be partially paid—with wage replacement of about 55% of your pay, up to $1067 per week—through California’s Employment Development Department (EDD)? Dads: did you know that most of you are eligible for 12 weeks of job-protected leave to bond with your new baby? Did you know that you can take that time off any time within the first year, including in increments? Did you know that up to six weeks of that time would be paid through EDD’s Paid Family Leave program (also 55% of pay up to $1067)? Moms and dads: Knowing that, will you take the maximum job-protected leave allowed to you? No? How about the maximum amount of leave that is paid? Why not? I have asked dozens of new parents these questions. . . . Welcome to the Mizrahi Law Blog! Stay tuned. Within the next several weeks, I will be posting about some of California’s leave laws, including what they are, how they came to be, and ways they can be improved.